Harry Buckley is used to adapting to unexpected situations. Brought up as a son of a soldier he moved every two years across the world from Australia to Germany, Holland to the UK. Aside from his great grandparents, who were apple growers in Norfolk, he does not come from a farming background. It was during a stay in Australia in 2012 his interest in farming was ignited having been captivated by the tales of the cattle station and excitement. Studying A Levels at East Norfolk Sixth Form College following his father’s retirement, he admits his enthusiasm for education was waning. “In my A-Level years I was at a loss as to what I wanted to do,” he says. “I knew I wanted to go on a gap year but that was it. “I had started to fall out of love with education and wanted to experience life working hopefully to point myself in the right direction of where I wanted to end up. “I completed my A-Levels in 2012 and left for my gap year, which turned into five years. A lack of interest in my chosen courses, other than music technology, meant I achieved two A2 levels in music technology (C), and human biology (E). I took further AS Levels achieving ICT (D), maths (E), and chemistry (E). “I was not happy with my grades but had already jumped on a plane to Australia by the time the results were released. The Skype call from my dad explaining how disappointed he was included the use of the red hang up button and a commiseration beer. Harry’s choice to travel to Australia was borne out of his parent’s zest for the country. During his year 12 Harry had already sent out letters to boarding schools across Queensland with his CV looking for a sports coach and boarding master gap year and was accepted by the Scots PGC College in Warwick, QLD. In 2012 Warwick, and the surrounding areas, endured a major flood, ripping down fencing and destroying crops and soil structures and Harry helped recover the area and complete daily livestock tasks. After his first year was up Harry returned home only to discover the only place he really wanted to be at the time was back in Australia. 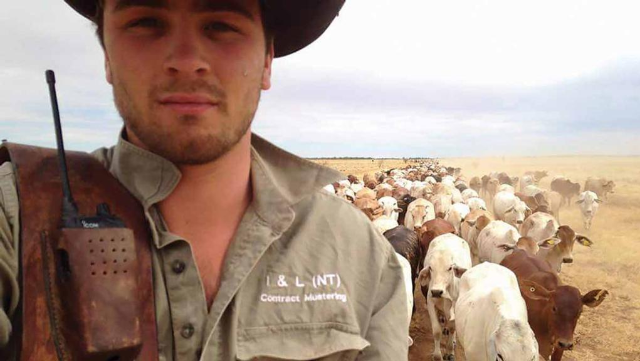 This time he chose to travel and experience isolated parts of the outback and through perseverance was offered a job on Lake Nash cattle Station in the Northern Territory. The 4.2 million acre property, owned by Georgina Pastoral Company, is the breeding station on the Barkley Tablelands. “It was here I learnt to ride horses for the sole use of chasing and rounding up cattle. There was one moment where my head-stockman Aaron Land pulled over the Toyota ute we were driving in the middle of nowhere, stepped out, hopped on the back of the tray and told me to come sit down. The decision to study a degree derived from a conversation with a long term best friend who had told him he was looking at universities to study agriculture. “Bradley had been to Australia with me and worked on the same station as I had and he also shared the aim of eventually going back. “He, and my parents, suggested I phone Harper Adams and see if they would accept me onto anything. I was extremely reluctant due to my A-Level results being terrible, I think I was scared of the rejection and being told I wasn’t going to be able to pursue something. So late August Harry picked up the phone and rang clearing. “It was one of the most nerve racking experiences of my life bearing in mind I have been chased by four-year old horned bulls who have never seen a human being. As a third year student studying agriculture with mechanisation, Harry is determined to return to Australia and reside their permanently and since applying through clearing has never looked back. “My advice for anyone wondering whether they should do it is to pick up the phone and ask. Even if you are like me and never thought in a million years you would end up in uni it is always worth a phone call to find out what your options are.